1. Heat oil: Add 2 tbs oil in a karahi/non-stick pan & heat on medium. 2. Add mustard seeds & curry leaves. Let it crackle. 4. Add the suji & roast all together till sooji/semolina gets very light brown. 5. Add tomatoes (chopped) & green chillies & stir for few min. 6. Add water, enough to cover the suji with a thin film (about 1/2-1 cm above). 8. Stir & cover for about 5min. on low heat. Let it swell & absorb all water. Open the lid & Stir everything together. If it feels too dry or suji has not fully absorbed water, add little more, or else just let it all mix. It shd not be too soggy or too dry. See the pic for the texture. Check for salt. 9. Squeeze freshly cut lemon all over the upma & spread chopped coriander leaves. 10. Yeah... UPMA is READY!!! 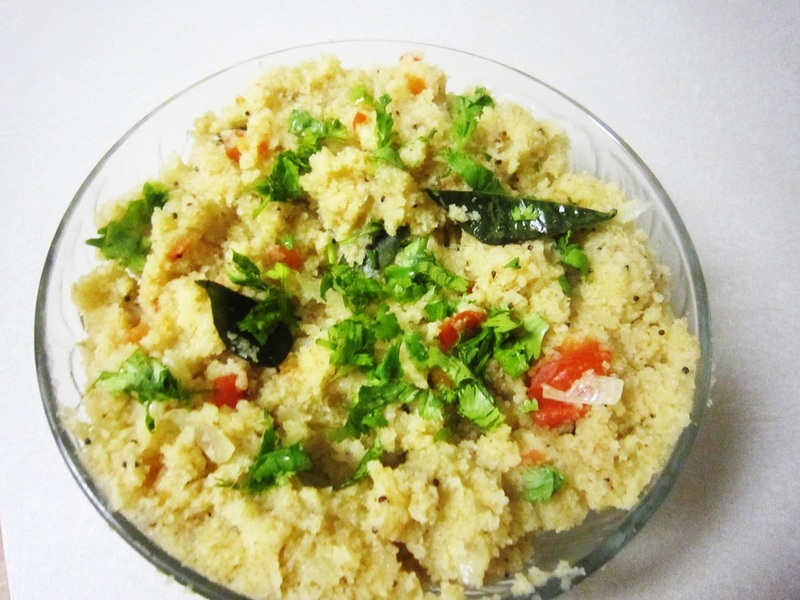 Make this interesting upma or Indian snack from fine or course semolina, sold at Indian grocery stores. It is south Indian dish & loved my kids & old alike.